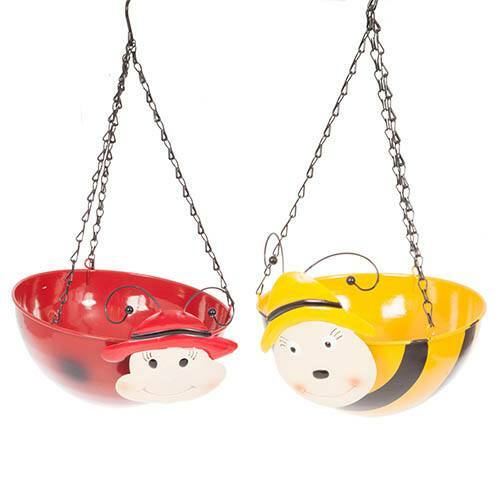 Add a bit of fun to your garden with these novelty bumblebee and ladybird hanging baskets. Ideal as a gift this Christmas or save for Spring next year, these “wobblehead” baskets are perfect for getting the kids or grandkids involved in gardening and they come as one of each design; ladybird and bumblebee. The heads are attached to the main basket by a spring which allows the head to wobble – hence the name, “wobblehead”! They’ll bounce around in the breeze and really add something different to your floral displays. The metal baskets have a drainage hole in the bottom and come with chains attached so you can plant up and hang right away. With a diameter of 28cm there’s plenty of room to fit in your favourite basket and bedding plants in – why not plant up a mix of different colour to create a real stand-out display?! Supplied as a set of 2 metal hanging baskets with 3 point metal chains. One of each style bumblebee and ladybird.